That's how this works Blue. 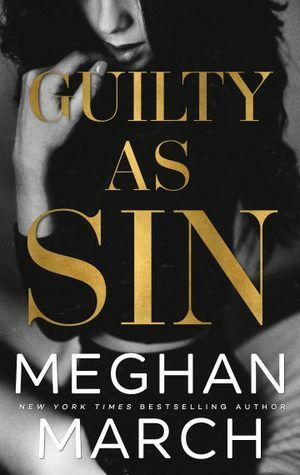 GUILTY AS SIN: Is the second book in Meghan March’s ‘Sin’ trilogy. It picks up right where ‘Richer than Sin’ ended off. Spoken in ‘Dual Perspectives’ Flits back to 'Past & Present' effortlessly. With how things left off in Richer than Sin I was super eager to get my hands on ‘Guilty as Sin’ one of my most highly anticipated reads for September. And Meghan March did not disappoint with this book, which cemented her as one of my most favourite authors, you can not fault her, each book, each series, just gets better and better, each and every one is completely unique, and she delivers each and every time..
Because every sin begets a sin. We followed Whitney and Lincoln’s rocky journey in ‘Richer than Sin’ with their forbidden relationship and the sins of the past that always kept coming back to haunt them and all the drama that came with that. A Gable and a Riscoff could never be together. Fate would never let it happen. But in this we're given so much more, more background information that was missing in the first book, now it all starts taking shape in this, more angst, more drama, more threats, more suspense, more secrets. What happened a decade ago between Lincoln and me colours every moment of our present. Just when you think things are all coming together as they should do and your lulled into a false sense of security the author pulls the rug out from under your feet and your left dangling over another cliffy, so yet again the the Queen of Cliffys strikes again!! The ending is a whole new game changer, things are about to get turned upside down, inside out, and I can't wait to see what happens in the very last installment of this.